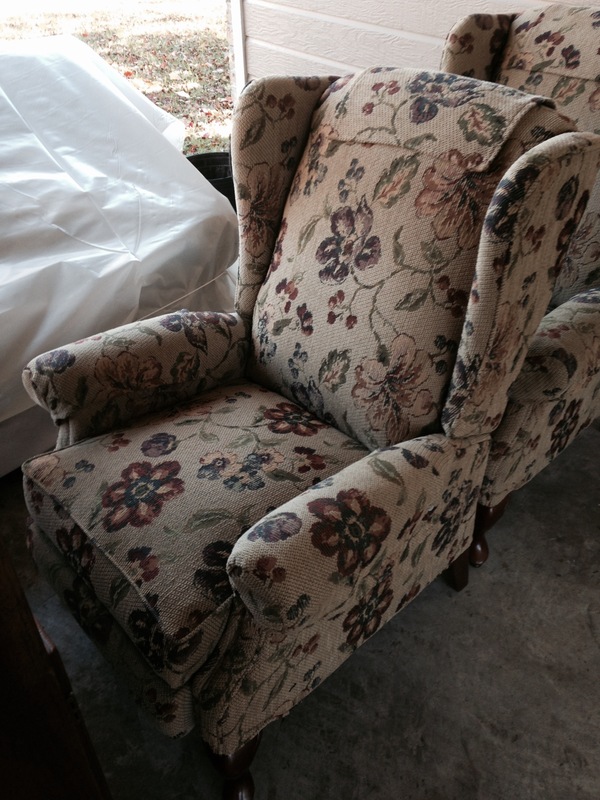 Last year, my wonderful in-laws gave us two wingback reclining chairs that they no longer wanted. They were in great shape but I would need to recover them to fit into our decor. 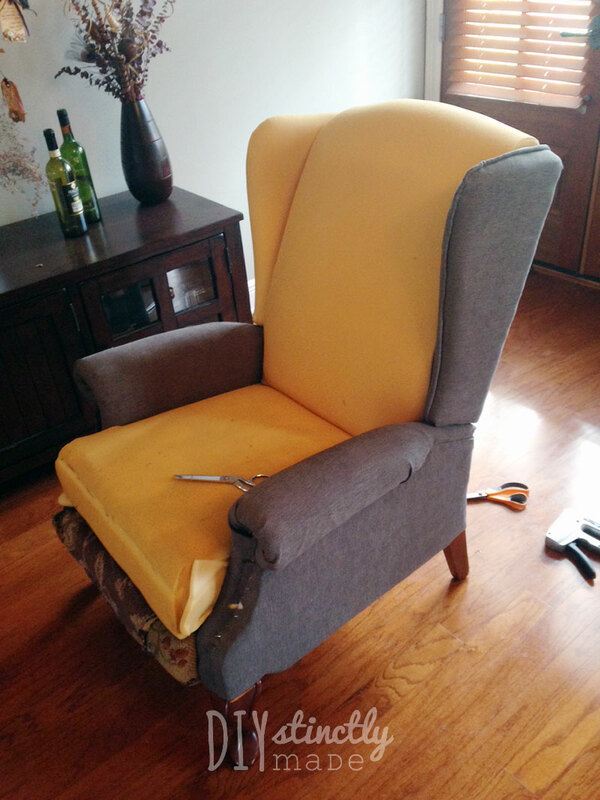 I tested the waters, dove straight in to my first re-upholstery project, and successfully transformed the look of our new DIY Re-upholstered Wingback Chair (which now resides in our living room). With one out of the way, the second chair got pushed to the bottom of my project list. 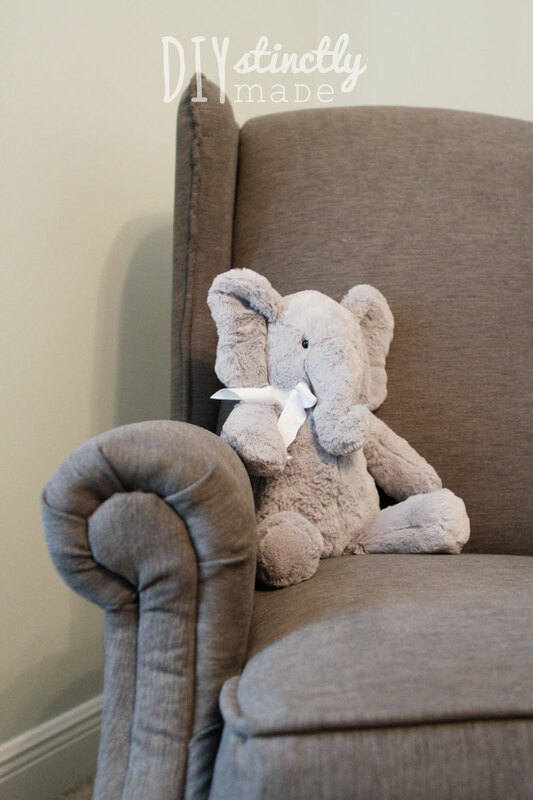 Several other projects, and a pregnancy surprise later, I came back to the second wingback chair. 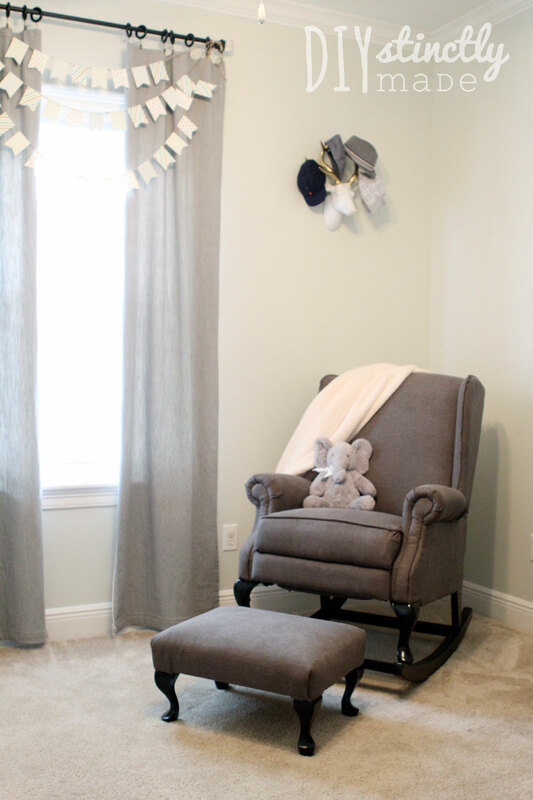 For the nursery, I was originally expecting to paint an old wooden rocker that probably wouldn’t have been as comfortable as I would have liked. 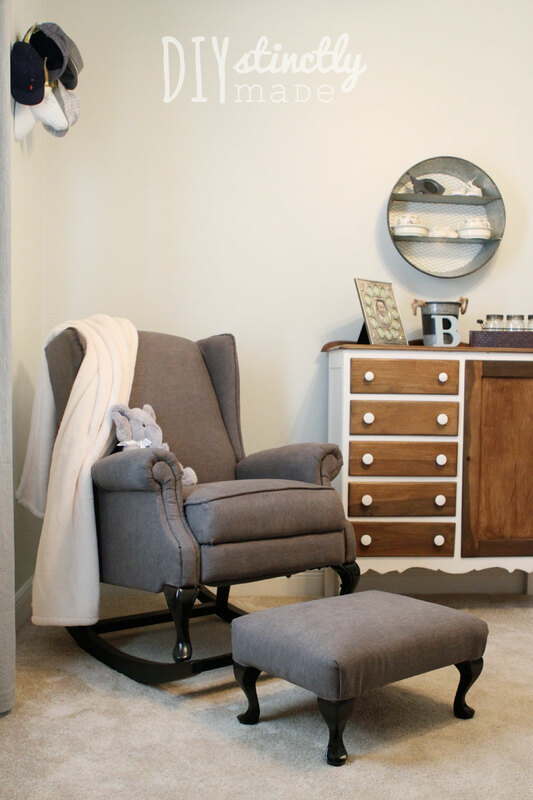 As I did more research/pinning, I became drawn to the beautiful comfy rocking chairs at Pottery Barn, however, with price tags of $1000+ there was no way in HELL I was getting one. 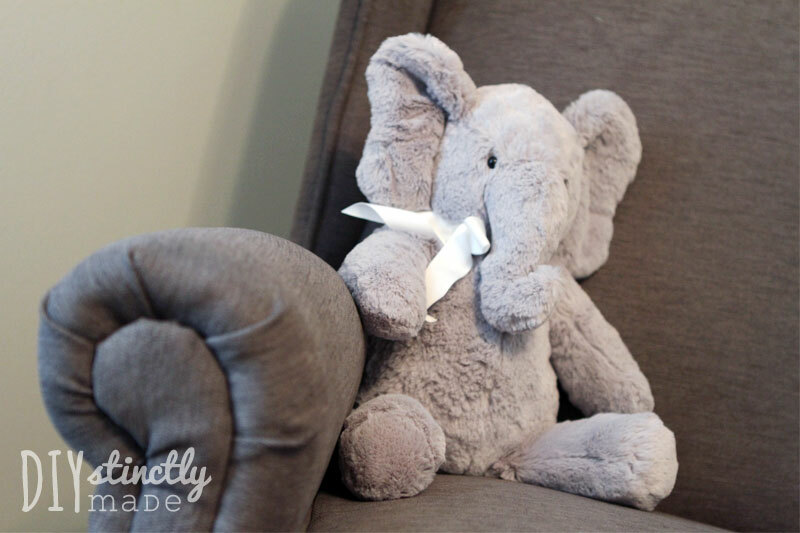 Then it clicked in my head… we HAD a wingback chair that was just sitting around… Maybe we could DIY this project? No…. Yes? I was skeptical, but I decided to go for it. And I am SO glad I did! 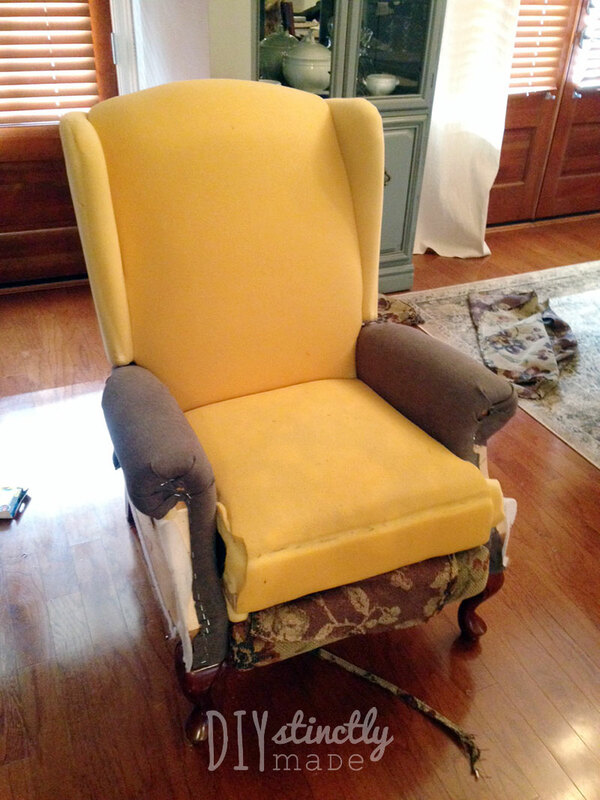 First up, I had to re-upholster the chair since I had been putting it off. 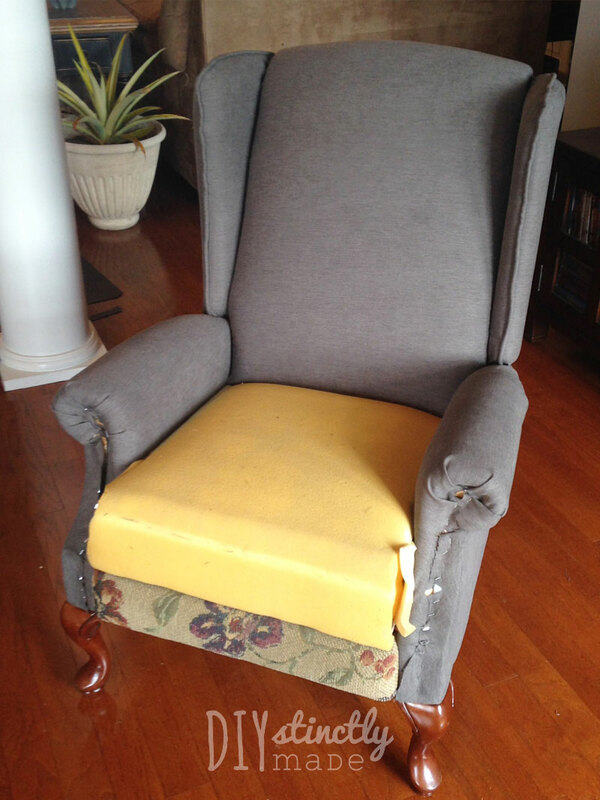 I used the same technique as our DIY Re-upholstered Wingback Chair. Remove the staples, cut the new fabric to size, and staple new fabric in place. 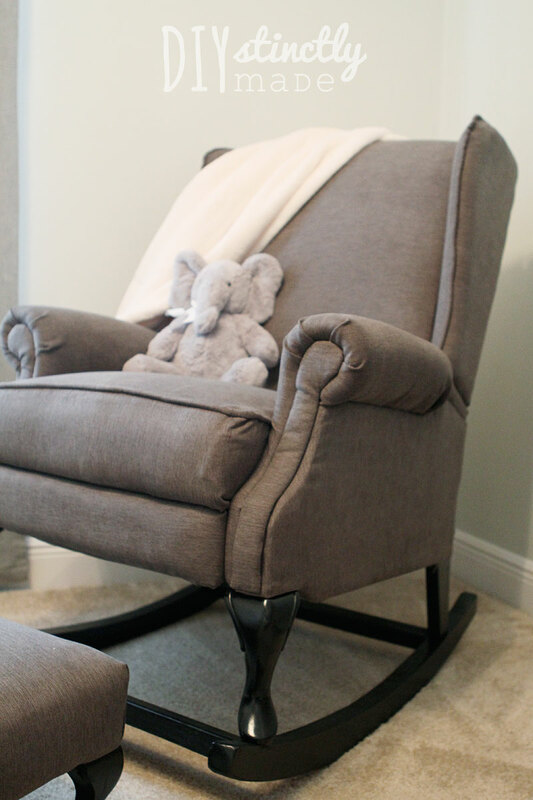 A couple of months prior, when I picked out fabric for our two “new” wingback chairs, I had purchased a gender-neutral charcoal grey fabric, not knowing the chair would be used for a nursery. For the rocking chair runners, I tried to find an old broken rocker to take these from… but I had no luck. I did some research online and was able to find some for around $50, but that was $50 that I felt we didn’t need to spend. So I measured the length of how long I thought the rockers needed to be and I drew a template on wax paper. SO NOT the “right way” to do this, but it worked! When I told my Paw Paw that I free-handed a template, he suggested using a string and pencil to make a perfect curve by anchoring the string at a central point and pivoting the pencil (tied to the string) around it. That sounds like a way smarter idea but thankfully I have some serious skills in the free-hand curve drawing department. Once Kurt and I traced the rocking chair runner templates on a 2’x10′ pine board, he cut them out using a jigsaw. They DID NOT come out perfect but with some 60 grit sand paper and a belt sander, we were able to get them even enough to rock smoothly. 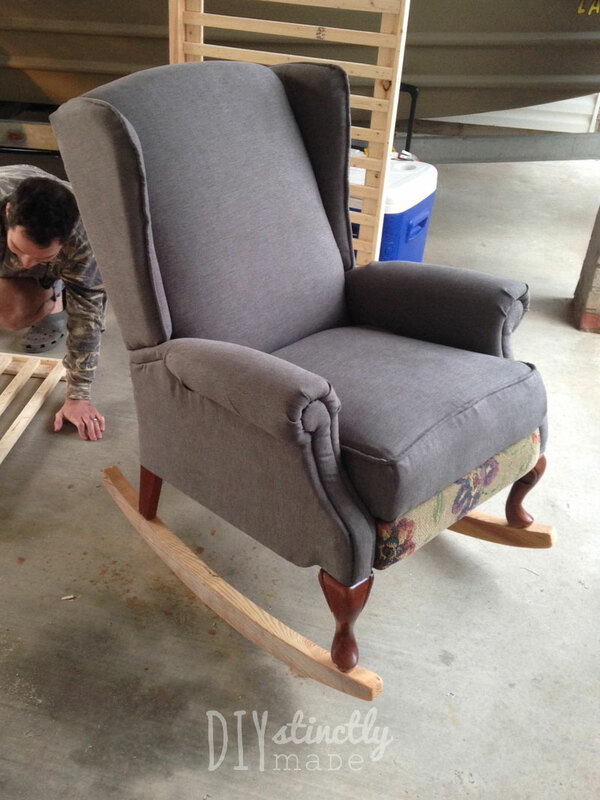 Kurt then cut the feet of the wingback chair at an angle to match the curve of the rocking chair runners using a jigsaw. We flipped the chair over and screwed the runners into the feet of the chair. For additional stability, we added horizontal supports below both sets of chair legs. Once it was all assembled, we spray painted the legs using Rust-Oleum Black Matte spray paint and sealed with polyurethane. I had tried to stain the runners to match the color of the chair’s legs, but that didn’t turnout. 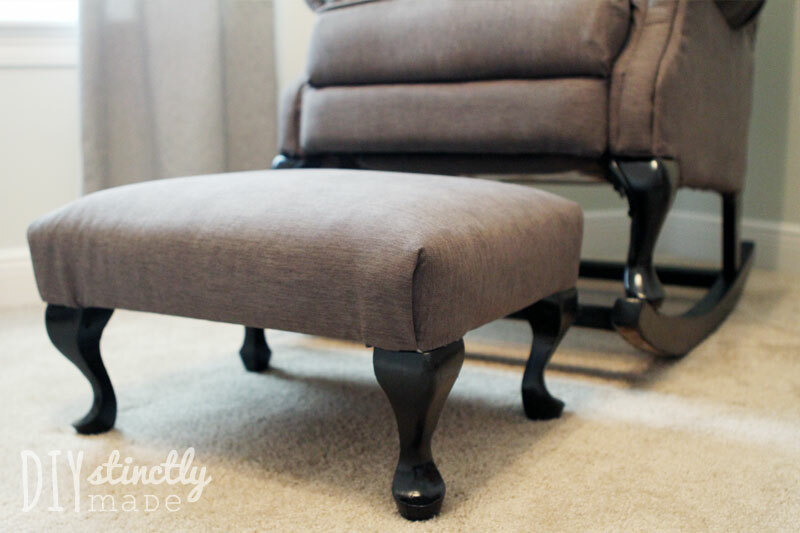 I found the ottoman at an estate sale and bought it for $13. 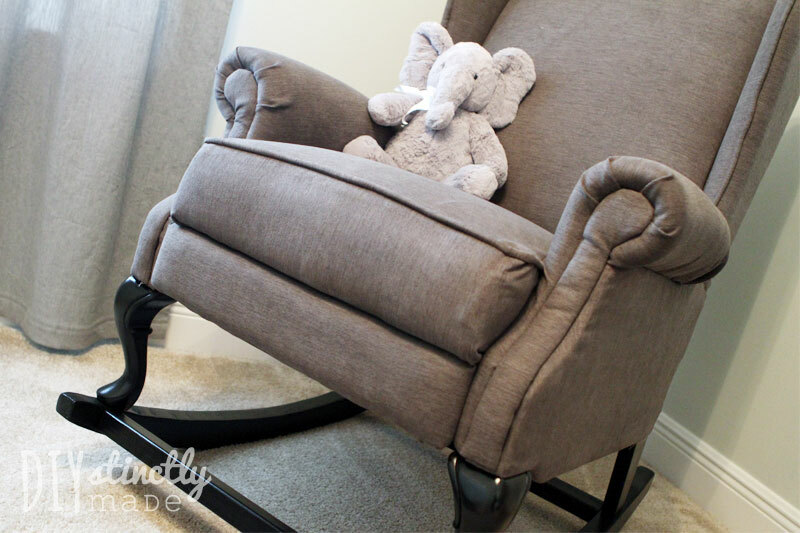 I thought the legs would match perfectly with the chair and thankfully I had enough fabric to cover it, too! Your chair looks absolutely lovely, great job! 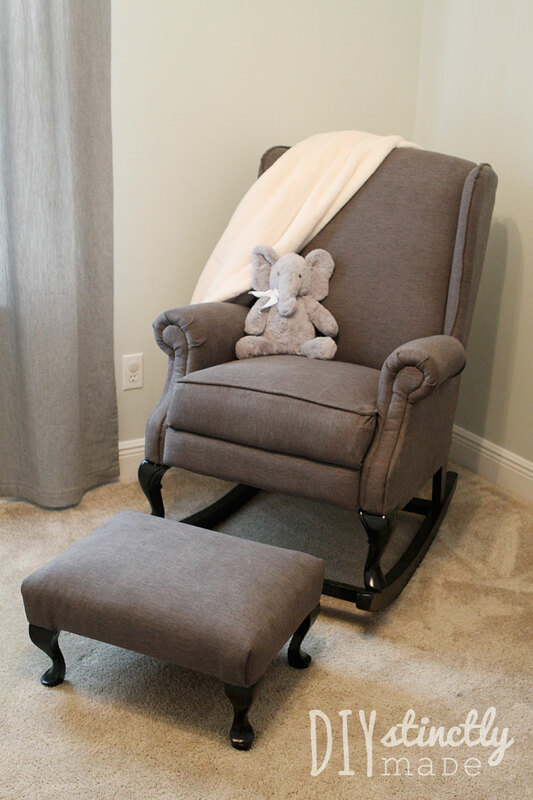 I am considering doing a rocking chair diy as well, but wondered if you have a template for your runners that you would be willing to share? Hey Nicole! Unfortunately, I drew the runners on a piece of wax paper (lol) and did not keep it as a template. 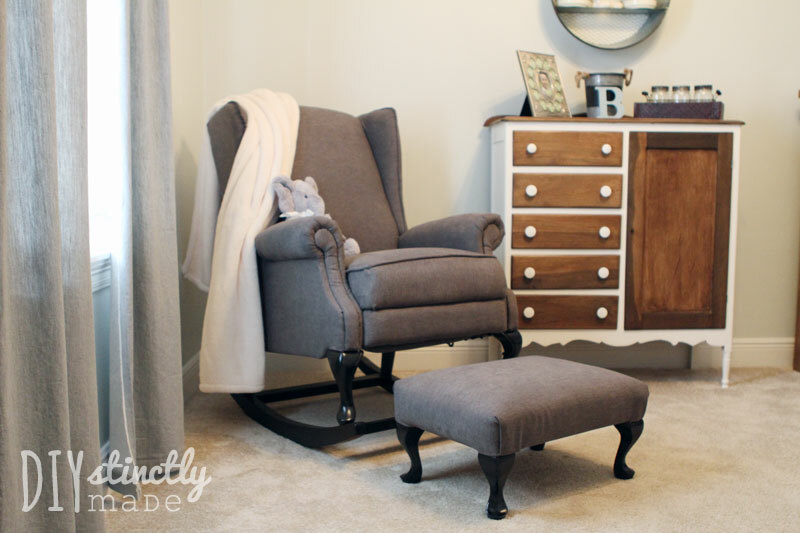 I used another rocking chair we had in the house as an example. Your chair is perfection. I am struggling with ordering runners for an identical chair. I’m not even attempting to make them. I’m struggling with what length to order the runners. Would you by any chance be able to measure the length of your runners?